A warm, make-ahead breakfast with just a few minutes of prep? Yes, it’s possible thanks to this recipe for Slow Cooker Steel Cut Oatmeal with Bananas. Last week’s cold snap reminded me how much I love warm breakfasts. Truthfully any type of hot food was welcome during that freakishly freezing weather, but there is something so comforting and satisfying about a toasty bowl of oatmeal to start the day. Plus steel cut oats always keep me full for the entire morning. 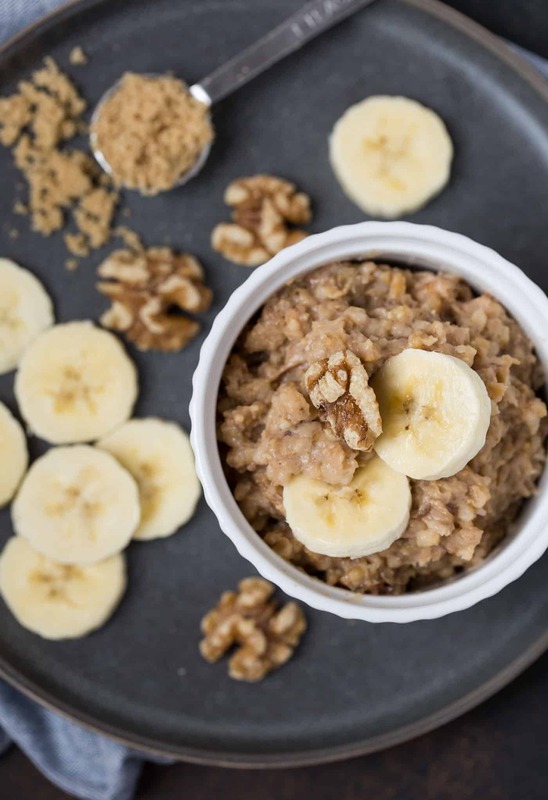 This Slow Cooker Steel Cut Oatmeal with Bananas recipe creates a tempting aroma that coaxes even the sleepiest of heads out of their warm beds in the morning. 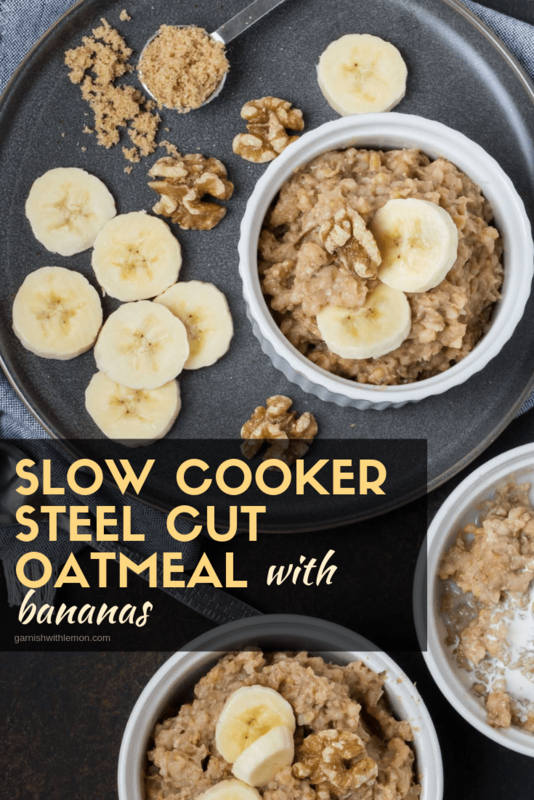 Get out your large slow cooker for this Slow Cooker Steel Cut Oatmeal recipe and find a heat-proof container that will fit inside it (I used CorningWare, but Pyrex would work well, too). Combine all of the ingredients in the dish and then place it in the middle of your slow cooker. Add enough water to the slow cooker until it is about an inch or so below the top of the dish. Then step back and let ‘er cook. That tiny bit of effort ensures your oatmeal cooks gently and evenly in its toasty water bath. And no overcooked edges or bottoms means no scrubbing crusty, baked-on oatmeal out of your slow cooker the next day. I mean, really, who wants to do dishes first thing in the morning? 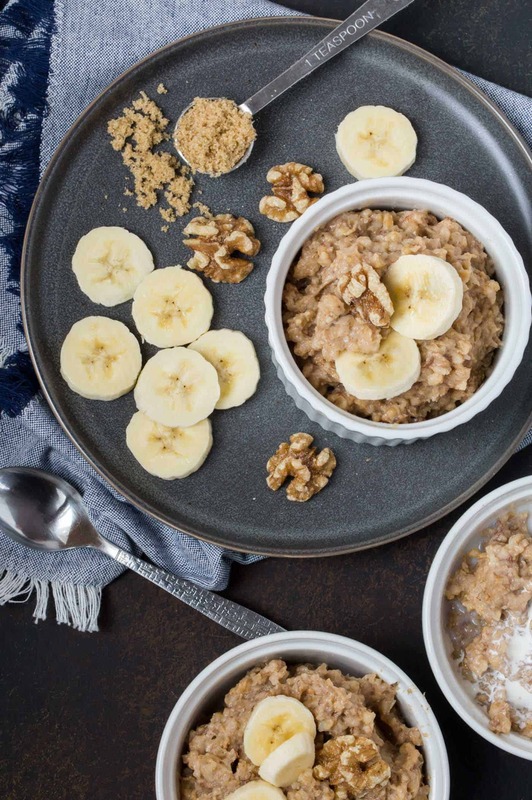 This Slow Cooker Steel Cut Oatmeal with Bananas keeps for a week in the fridge and needs just a bit of milk when reheating to bring the leftovers back to their glory, just like our crazy popular Baked Steel Cut Oats with Apples and Cinnamon recipe. 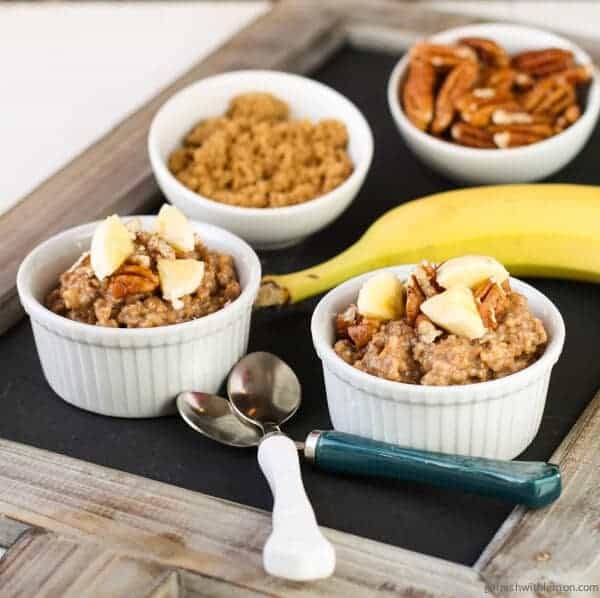 But our slow cooker oatmeal recipe has the advantage if you have guests who are early risers because you can set out the toppings – brown sugar, walnuts or pecans, and bananas – next to the slow cooker and have guests help themselves whenever they wake up in the morning. Pop a tray of these make-ahead Cherry Almond Smoothie Shooters in the fridge before you call it a night and consider breakfast done. Nothing beats a self-service buffet when you’re hosting a crew, especially if you’re not an early bird. Love oatmeal in the morning? Check out some of our other favorite recipes for this belly-warming breakfast! Combine milk, mashed banana, brown sugar, cinnamon, vanilla, salt and oats in a heat proof bowl. Place in your Crock Pot and fill the Crock Pot with enough water so it is about one inch from the top of the bowl. When ready to serve, carefully remove hot bowl from Crock Pot. Gently stir oatmeal until it is thoroughly combined. Serve with pecans, banana slices and extra brown sugar. What a wonderful idea!!! That looks, and sounds fantastic! I have always been too scared to try crockpot oatmeal as I have heard too many horror stories…..and would like to have more than 6 hours sleep! This will be great to try! Thanks so much! I need to keep up my carbohydrate level for my high level of training, and oatmeal is a wonderful way to fuel up before a workout or race! Giving this a try asap! Thanks! Hoping this hits the spot for you, Tina. Thanks for stopping by! Great recipe! As a nursing mother, oatmeal is so important, it helps keep your supply up! It gets old after having it so often though, this looks like a fantastic twist! Thanks! Gotta keep mama happy to power through those early morning feedings! Thanks for stopping by, Hannah. At our house we use an outlet timer for our crockpot (the kind that you would use to automatically turn lamps on and off while on vacation). It turns the crockpot on and off automatically so we don’t have to worry about over cooking anything and we can still get enough sleep! I thought I’d pass along the tip to you. Sleep + a yummy breakfast = the best of both worlds! I never thought of that, Mary. Genius! YUM! I eat oatmeal every single day for breakfast, but have never made it in the crockpot! I love that I could make this ahead and have breakfast ready for the week. Perfect! It’s always nice to have a new option to shake up the morning routine, right? Hope you enjoy it, Taylor! Since becoming pregnant I have eaten a lot of oatmeal–it keeps me feeling full and I know I can add the healthy good stuff to it. Love this slow cooker version! Delicious and easy to make! Thanks for sharing! Pinning! I love the water bath tip! I have to eat better breakfasts, I think this is the perfect way to kick of my new meal plan! Pinning this for sure! The water bath rocks. No more crusty, dried out oatmeal edges! This is awesome for busy school mornings! Amen. It’s nice to have breakfast taken care of so (if you’re like me) you can focus your attention on herding kids out the door. I’m not a huge oatmeal fan, but a total banana bread fan so I need to try this ASAP! Hoping these steel cut oats win you over, Marnely! Maybe a little extra banana, brown sugar and pecans will do the trick! This looks great! I’m not a morning person AT ALL, so I’m always on the lookout for easy breakfasts that are still substantial. Perhaps the aroma of this oatmeal will make waking up a little bit easier, Lauren! Awesome trick with the water bath!!! Oatmeal is my winter breakfast staple, and I love the make ahead technique. Making this in the Crock Pot allows for just a few extra minutes of sleep in the mornings…who can’t use that? So smart and so pretty! I would never have thought to use a water bath to keep the oatmeal from dying out! Nicole, it was new to me, too, but it sure is slick! Warm comforting oatmeal in the morning…yes. Scrubbing dishes in the morning…no way!!! I love the great tip on using another dish inside the crock pot to bake it evenly!! Baked oatmeal is a favorite of mine during the winter months! Love the tip about the water bath! Thanks, Jessica. You can’t beat waking up to breakfast that’s already made! LOVE crockpot oatmeal and this version looks phenomenal! For a variety could you use other fruits instead of bananas? Mashed or pureed – Strawberries, peaches, blueberries or apples? Maybe a mixture of two? Would it still taste as good with all other ingredients, cinnamon, brown sugar, vanilla, milk and just use whatever toppings you like? Hi Diane, I haven’t made the recipe as written with any other ingredients, but it seems pretty forgiving. Apples seem like the easiest fruit to substitute, but give it a try with the other fruits you mentioned and simply omit the cinnamon until you taste the finished product. You can always stir it in before serving if you still want it. Or you may find another spice suits the flavor better. Happy experimenting! Made this oatmeal last night-what a great way to wake up this morning! It was so yummy and the water bath worked perfectly! Yay! So glad the Baumanns enjoyed it! Can’t wait to make this. Just wondering, how big of a Corningware dish did you use for the 3 cup milk 1 cup oats batch? Want to make sure it doesn’t overflow while cooking. Also do you think I could use water or almond milk for this? My LO has a dairy sensitivity. I used my 1.6 L round CorningWare dish without any issues. And definitely experiment with the liquid of your choice. Enjoy! What if I don’t have a crock-pot? Is there anyway around this? Hi Lauren, You can certainly make the oats on the stovetop (with the milk) and then mix in the remaining ingredients while everything is still warm. Hope that helps! This looks great – one quick question. I usually make my oatmeal with water instead of milk, do you think this recipe will hold up with this substitution? Yes, feel free to substitute water for milk. Hope you enjoy! I’m a novice at this. What would be a “heat safe bowl” appropriate for a crock pot? I have glass bowls that say “Conventional oven, microwave safe, no stovetop, no broiler use” but don’t know about crock pot. THANKS! Hi Lisa, good question. Anything that says oven safe is perfectly fine for the crock pot. I used a corningware bowl if that helps at all. Enjoy! What a brilliant idea!!!!! I cannot wait to make this for the weekend. So glad to have found this site. Thanks for stopping by, Keisha. Hope you enjoy the oatmeal! Looks like I found something to substitute my cereal in the morning! A great way to start the day for sure!